Meditation takes place regularly at the House of Meditation. Please see the Blue Mountain Lotus Society website for dates and times. Book Discussions: Held at Borders of Harrisburg, 7 p.m., second Monday of each month (Examples of books discussed include Why God Won’t Go Away: Brain Science and the Biology of Belief by Andrew Newberg, Eugene D’Aquili, and Vince Rause; Siddhartha by Hermann Hesse, and Hero With A Thousand Faces by Joseph Campbell.). 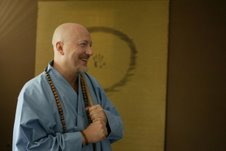 The Blue Mountain Lotus Society began, unofficially, when Sensei Anthony Stultz came to Harrisburg in the mid 1990’s. He began with the idea of establishing a community, or sangha, before trying to obtain any physical location. The first students who began studying under Sensei Stultz were doctors from the Harrisburg Hospital. The sangha has steadily grown since then to include many area residents who have been drawn to Sensei Stultz and Buddhism. It is a very new organization to the region. The name Blue Mountain Lotus Society brings together a reference to “Blue Mountain,” a Pennsylvania mountain ridge that runs along Harrisburg’s northern edge and the lotus, a traditional Buddhist symbol. English is spoken conversationally among members and is used extensively in worship services. The community is made up of mostly American-born Buddhists, though there are a few European-born and Native American members. As of 2006, the Blue Mountain Lotus Society resides in the House of Meditation, where events such as retreats, meditations, counseling, liturgies, and movement and art classes are offered.